Affordable flyers and postcards are a old school way to reach out to your customers and to create new customers. Affordable flyers and postcards are a great method to get cheap flyer and postcard printing in Vegas so that you can market to your customer base. Many business use affordable flyers and postcards in marketing to their customers. Fast food restaurants use flyers with take out orders to help customers remind them of what is on the menu and prices. Many times the flyers will have a coupon on them to help entice the customer to come back for more business. Affordable flyers and postcards are also used by promoters who send people to Las Vegas Strip to talk to tourists and pass out flyers to the tourists is in order to get them to patronize their entertainment venues. The promoters will pass out hundreds of flyers a night to the thousands of tourists walking along Las Vegas Blvd looking for something to do. Businesses will also hand out postcards at their businesses to help stimulate sales as well. In addition, inexpensive postcards can be mailed out to neighborhoods that surround their business to let people in the neighborhood know about their location. If you are a local only business, it makes no sense to advertise in a media that encompasses the entire city as people from across town are not going to make such a long journey to your store. 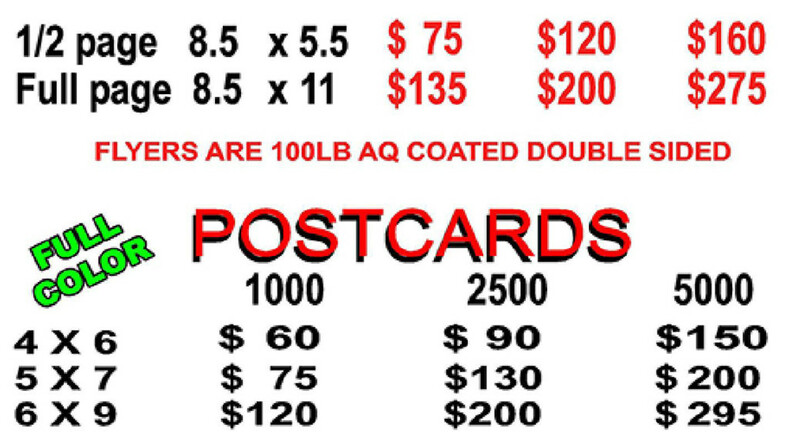 Passing out cheap postcards and flyers to your neighborhood is effective or mail marketing to specific area codes is much more effective. Flyers are generally printed on 100lb paper in gloss or matte ( double sided ) and postcards are generally printed on 14 point card stock with your choice of gloss or matte finish. Cheap postcards and flyer distribution work. See how it can help your business. Previous PostCustom Car Signs and StickersNext PostShuttle Bus Stickers and Signs For Advertisement.